Xtra Moenia is a site specific installation designed and produced by SOFTlab for the San Gennaro North Gate. The piece was commissioned by Two Bridges Neighborhood Council and produced by The They Co. 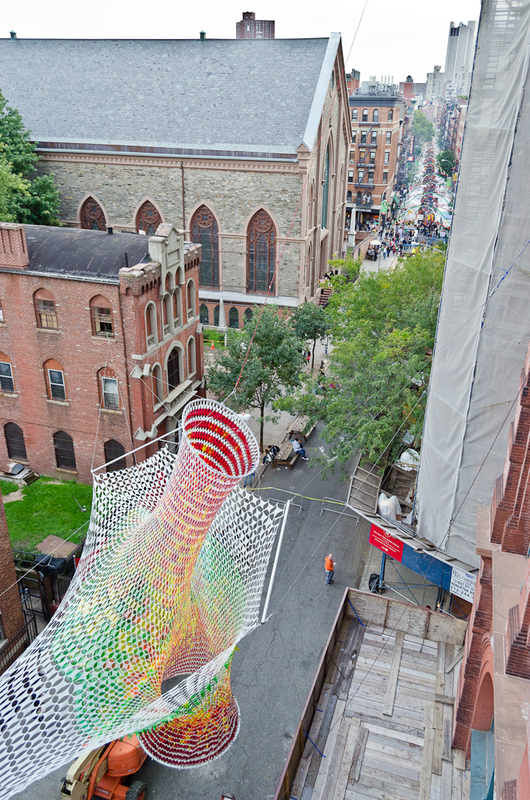 The installation serves as the North Gate to the annual San Gennaro Festival. We developed a form that created to distinct oculi as a reference to one of the simplest and most effective classical architecture devices. One oculi points up while the other hangs down defining a zone on the street for pedestrians. The two forms are created using a minimal surface blending the two oculi together in a way that blurs the distinction between the two. The final geometry was developed closely with the structural engineering firm Arup. The piece was completely held in tension from a series of cables that attached to surrounding buildings. The shape is completely site specific and can only find its’ true form when attached at specific points on the buildings and pulled perfectly into tension. Each panel on the surface is a custom fabricated unique piece scripted in a custom built software. The installation is made of 4224 mylar laser cut panels. Each panel is a unique shape and has a photo gel color panel to accompany it. The color panels vary across the surface to create tongues that flap in the wind. The panels are connected using over 6,000 aluminum grommets.